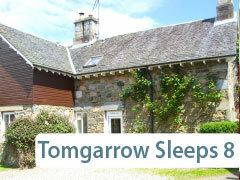 Tomgarrow is the perfect base for a wide range of guests with a huge range of activities within easy reach. Most parts of Scotland’s East & West Coast are easily accessible for day trips by car. If you fancy leaving the peace and tranquillity of the Lodges behind, Edinburgh, Inverness, Oban and Glasgow are all approximately 2 hours away by car. Closer to home you can visit Menzies Castle, historic home of the Menzies Clan. Nearby you will find Blair Castle home of Scotland’s only private army. Scone Palace, the crowning place of Scottish Kings is near Perth. Also an hours drive away is Drummond Castle Gardens, near Crieff, boasting a beautifully maintained Knot Garden. In Kenmore you can visit the fascinating Scottish Crannog or Taymouth Castle, the seat of the Earls of Breadalbane. Highland Perthshire has more than it's share of Distilleries, from Dewar’s Aberfeldy distillery - home of the Mini Military Tattoo, Edradour Distillery near Pitlochry to the Famous Grouse Centre near Crieff, whatever your Whisky palate there will be a distillery for you in Highland Perthshire. Tayside holds many delights for the art lover, in nearby Aberfeldy you will find the Temple Gallery, Aberfeldy Gallery, the Glen Lyon Gallery and The Watermill; all boast excellent exhibitions with the Watermill also being recently awarded the prize for Top Scottish Independent Bookshop 2006. A short journey will take you to Birnam Arts and Conference Centre where you can see a variety of theatrical or musical productions. In Birnam you will also find the Beatrix Potter Garden, inspired by her wonderful characters this garden will delight young and old. Perth Concert Hall and Perth Theatre host Music, Theatre, Comedy, Youth Theatre, Art & Media and Family events. You can even try your hand at Stage Make Up with the Blood, Guts and Gore workshop. Pitlochry Festival Theatre, the Theatre in the Hills, has something to suit every taste and interest - see a classic drama, an intriguing murder mystery or a 20th century epic. If shopping is what you like to do best, Tomgarrow is the place for you. You will find many artisans in Highland Perthshire producing wonderful, unique creations. In Kenmore you will find the recently opened Courtyard, a shopper’s delight and a short journey will take you to the House of Bruar - Scotland’s answer to Harrods - everything from gifts and curios to Scottish Tweeds & Tartans. Tomgarrow is the perfect base for walking holidays with the breathtaking Acharn Falls Walk starting minutes away. The Rob Roy Way running from Drymen to Pitlochry, following the tracks of Rob Roy MacGregor, runs through Acharn with the Queen’s Drive section right on your doorstep. There are many other beautiful walks in the local area whether you are looking for a casual stroll among beautiful countryside or some more strenuous action and the reward of perfect panoramas upon reaching the summit of Ben Lawers, the Tarmachan Ridge or perhaps Schiehallion. Highland Perthshire “Big Tree Country” is a wild life lovers delight with Acharn being blessed with many varieties of bird and animal. Golden Eagles can be spotted above the heather moor and in Acharn red squirrels are staking their claim to one of their last strongholds in Scotland. Highland Adventure Safaris can be arranged with Land Rover trip’s whisking you up into the hills to enjoy the Red Deer and Black Grouse in their native habitat and you can see for yourself the diversity of Scottish flaura and fauna. Highland Adventure Safaris also offer Gold Panning sessions which are great fun for young & the not so young. 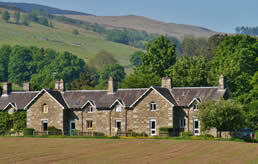 Clay Pigeon shooting is available in Glen Lyon at Chesthill. Golfers will struggle to find the time for the 19th hole with such a wide variety of courses on hand. World famous Gleneagles (one hour) is nearby and The Old Course at St. Andrews is within easy reach by car. Fishing is available on Loch Tay and boat owning guests in Tomgarrow have the use of private moorings, jetty and maintenance shed provided by the estate. Motor boats are discouraged on Loch Tay so tranquillity is almost guaranteed. Boats can also be hired during your stay. There is a Padi Diving tutor in Acharn and dives in Loch Tay can be arranged. Perthshire lays claim to “Scotland Watersports Capital” with over 35 different activities to choose from; so if you fancy taming the White Water in a raft, Kayaking a stretch of river or Duckying to name but a few, Tomgarrow is the place to be. The Liquid Life kayaking & rafting competition is held at Faskally each spring, Loch Tay Lodges have "Nae Limits". Canyoning, gorge walking and bridge jumping can all be experienced during your stay, why not try a bit of white knuckle adventure while you are here? Horse riding is available at the Breadalbane Stables, Kenmore or at Blair Castle Trekking. Quadbiking is available locally and for mountain bike fans Sustrans Route 7 is right on your doorstep. Highland Perthshire is abundant in cycle routes with the challenging Griffin Forest a short journey away or the Glen Lyon & Loch Tay route passing by your Lodge. Aberfeldy Recreation Centre hosts 4 triathlon events each year, so if endurance is what challenges you Tomgarrow is the perfect base. Glenshee Ski Centre and Glen Coe are within reach of Loch Tay Lodges (1.5 hours), Glenshee boasts 21 lifts and 36 runs and is perfect for both skiing and snowboarding. Whatever you choose, Loch Tay Lodges are the perfect base for your adventure holiday. When all the other activities have exhausted you, take a gentle stroll down to the secluded beach by the private moorings, sit back and relax, take in your surroundings. Watch the mist lift from Loch Tay to reveal a reflection of beautiful Kenmore and the Crannog in its mirrored surface, watch the clouds drift by and the birds glide past and wonder why it took you so long to discover this tranquil little piece of Heaven. Whatever you like to do in your leisure time Loch Tay Lodges make your holiday easy.